The Art Museum Riga Bourse is located in the historical centre of Riga and represents a new type of museums; the museum was opened in 2011. The museum offers to experience interrelation between East and West, as well as a dialogue between the classics and modernity. An important aspect of the new museum is harmony between the acquisition of knowledge and recreation, as well as the breaking down of barriers between various forms of culture. 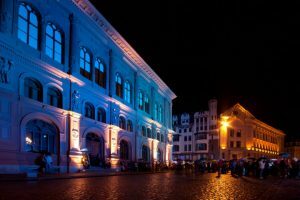 The Museum is located in the Riga Bourse building that is an architectural monument of national importance. The building was constructed from 1852 to 1855 following Venetian Renaissance palazzo forms that symbolise wealth and abundance. The building was designed by an architect from St. Petersburg of German origin Harald Julius von Bosse (1812-1894). After its successful reconstruction the Art Museum Riga Bourse on its six floors now houses modern exhibition halls, various expositions, the “Small School” for children, seminar and conference rooms, museum souvenir and art catalogue shop, as well as a café. Among other novelties, special relaxation areas and application of modern technologies, including audio guides for local and foreign guests must be mentioned. Exposition of the museum reflects perception of the 19th century on the 21st century, strives to reconstruct the atmosphere of that time taking the best of it but not copying. On the 4th floor there is the Painting Gallery located in the Venetian and Makart halls and is a classical exhibition of West European paintings, which, in terms of visual impression, are close to the 19th century understanding of the structure and placement of artworks. The ornate interior of the Venetian Hall is perfect for Dutch, Flemish, German, French, and Italian art. Pride of the collection is the North European school paintings from the 17th century. 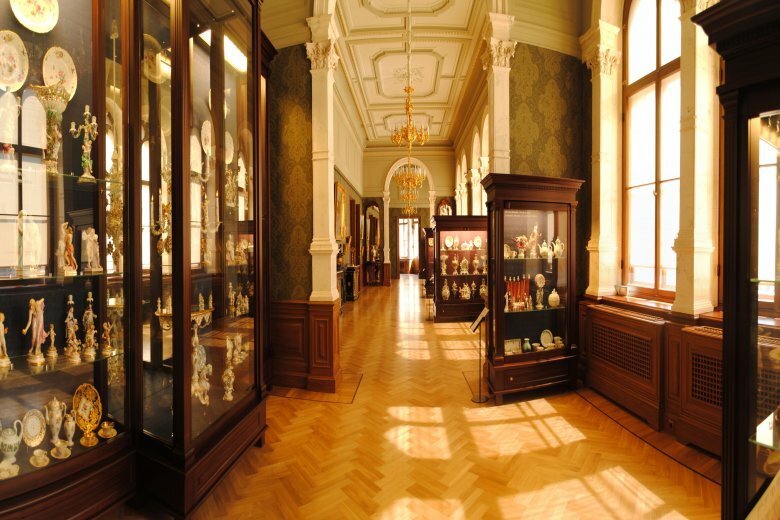 The Western Gallery is allocated for the magnificent West European porcelain collection from the 18th-20th century and stories about collectors from Riga. The gallery is intended to reflect the atmosphere of the 19th century, since that was the time of the German society of Riga to focus interior design and enthusiastic collecting. The greatest treasures of the gallery — porcelain from the Meissen Royal Porcelain Factory of 18th century. The Silver Room which is alongside the Western Gallery of porcelain, is fairly small, and dedicated to the early 20th century, when national self-confidence was very much on the rise in Latvia. 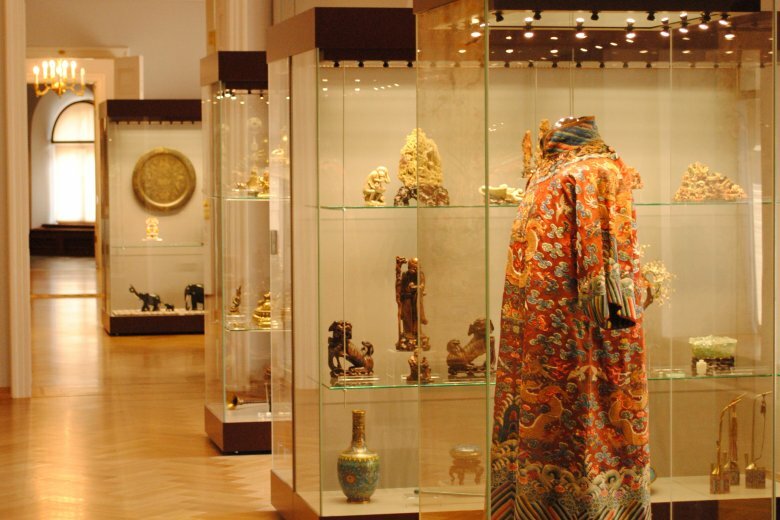 The Gallery of Oriental Art on the 3rd floor is home to a major collection of art from the Far East and the Middle East. The museum is proud of the largest Oriental art collection in Latvia and one of the largest in the Baltic States. The museum stock includes several Oriental traditional culture masterpiece collections that reflect various aspects of religion and everyday life. There is a wide exposition of traditional art of Japan, China, India, and Indonesia. In safe of the gallery there is the popular Ancient Egyptian art exposition that includes the only Egyptian mummy in wooden sarcophagus. After reconstruction the 1st floor halls have been turned into modern exhibition halls offering international exhibitions. The museum offers audio guide services providing stories about 37 pieces of art, as well as separate stories about the museum building and each gallery of the museum — all in all 42 stories in Latvian, English, and Russian. You can also choose a guided tour around the museum. We offer excursions in Latvian, English, Russian, and Spanish for various age groups. Guided tours must be booked in advance by phone (+371) 67 225209 or (+371) 67 226467 (for adults) and (+371) 67 357536 or (+371) 67 357534 (for school children).